The Masters in Public History is a professional degree that prepares students for positions in various historical venues, government agencies, business enterprises, and educational institutions. The degree also is excellent preparation for the traditional Ph.D. in History. 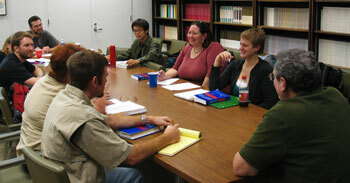 The University of Houston also offers a minor in Public History for the MA and Ph.D. in history. The University sets minimum standards for graduate admissions, which the Department of History has amplified. Applicants must be admitted to the Department’s graduate program before they are accepted as Public History majors or minors. Acceptance to the Public History Program is at the discretion of the CPH Director, but admission into the graduate program normally assures acceptance. Following admission to the University of Houston, students can choose from two tracks for the MA in Public History: a 36-hour Non-thesis track or a 30-hour Thesis track. The Non-thesis track is designed to prepare students for professional employment in a wide range of public history venues and emphasizes hands-on research and practical training. This option is ideal for students wishing to pursue a career in public history. The Thesis track combines the opportunity to engage in practical public history training with the more traditional research and writing component of a thesis. This is a good option for students who might wish to later pursue a Ph.D. or who want to broaden their skills and training in the field of public history. Both options allow flexibility for students to tailor their coursework to their interests, as well as to engage with the vast public history resources in the Houston area. A combination of public history research and special topics courses, courses selected from department offerings, and courses from related disciplines, with the approval of the Director or Associate Director (12 credit hours). A combination of public history research and special topics courses, courses selected from department offerings, and courses from related disciplines, with the approval of the Director or Associate Director (6 credit hours). Competence in a foreign language (reading) or computer science. * Students selecting the Thesis track should meet with the CPH Director or Associate Director upon acceptance and enrollment to discuss their plans. The minor in public history for the MA (thesis and non-thesis tracks) requires 9 hours of public history courses, including introductory course (HIST 6381). Students should consult with the Director or Associate Director about courses. Ph.D. students may choose Public History as their minor field according to the current guidelines of the department’s Ph.D. program. They should discuss course selections with their advisor and the Director or Associate Director of CPH.